Recorded on May 23, 2010. No excuses. I was just being lazy. 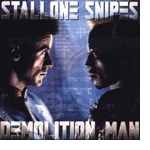 This week on Gutter Trash, Jason and I review Demolition Man starring Sylvester Stallone and Wesley Snipes. Music by Legbone, Black Wolf Fight and Dead Kennedys. On the Romero versus Italian zombie movie thing…. Romero offers a social commentary on consumer culture & the decay of individuality in western society. So there’s a level other than gore & juvenile coolness. The Italian movies are occasionally entertaining, but there’s a reason why Night of the Living Dead & Dawn of the Dead are still relevant & important in a way Burial Ground, Zombie, Revenge of the Living Dead, House of the Dead, Resident Evil, & even the beloved Bone Yard never will be. I take my grandma to Taco Bell 2-3 times a week & we both get the cheesy bean & rice burrito.